Pat chuck roast dry. Season with salt and pepper. Heat a large skillet to medium high heat. Add olive oil to the pan. Then add chuck roast and sear each side for 2-3 minutes until it is slightly browned. Put seared chuck in the slow cooker. Add bacon to the skillet. Saute until browned. About 3-4 minutes. Add bacon to the slow cooker. Next add onions and garlic to skillet. Saute until onions are translucent, about 2-3 minutes. Add onions to slow cooker. Next, add red wine to hot skillet. Using a wooden spoon, scrap all the brown bits of the bottom of the pan. Add in the beef stock and tomato paste to pan, whisk together and continue to scrap the pan until everything is removed. Add bundle of thyme to slow cooker along with carrots, mushrooms, and pear onions. 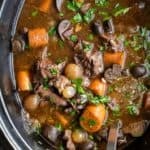 Pour red wine mixture into the slow cooker. Gently stir and cover. Cook on LOW for 6-8 hours, or until meat is tender. Garnish with additional thyme or flat leaf parsley. If the sauce is not thick enough, add 1 tablespoon of cornstarch (or arrowroot) along with 1 tablespoon of water to a small bowl. Mix together until the dry ingredients are dissolved. Stir that mixture into the sauce and let cook for 5 minutes. Serve.